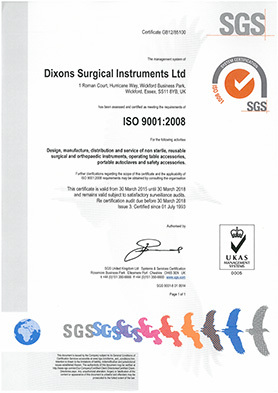 Dixons are committed to meeting the quality requirements of todays market, and were one of the first British Surgical Instrument manufacturers to achieve certification to BS5750 in July 1993. We are registered as a Contract Manufacturer with the FDA, and CE Mark our own Class I Medical Devices in compliance with the Medical Device Directive 93/42/EEC. 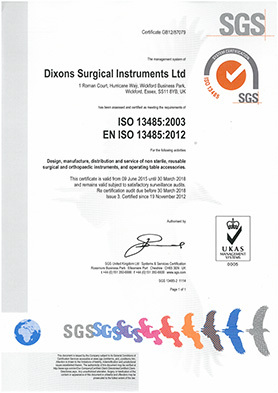 Dixons are currently running a Quality System which has been certified to BS EN ISO 9001:2008 and EN ISO 13485:2012. We have had this system approved by SGS, who are a UKAS approved assessor. We are subject to surveillance visits to ensure that we are keeping the system up to scratch. "Design, manufacture, distribution and service of non sterile, reusable surgical and orthopaedic instruments, operating table accessories, portable autoclaves and safety accessories." "Design, manufacture, distribution and service of non sterile, reusable surgical and orthopaedic instruments, and operating table accessories." Only the highest quality raw material is used in our manufacturing processes, with full material traceability. Copies of these certificates can be found on our Downloads page.